Does the State own the rail corridor? Does the State own the corridor? 1) DEC has researched the matter and has determined unmistakably that the State owns the full length of the corridor except for the parcels near North Country Community College – and that will be resolved soon. 2) A land owner contacted the State stating that his deed indicated that he owns a portion of the corridor and the railroad has an easement over their land. He was asked to provide a copy of the deed for review but he has not responded to that request. 3) A brief history of the ownership of the corridor below clearly demonstrates that the rail line was not a right-of-way but rather a fee ownership from the beginning. 4) Some references to federal "reversion clauses" and the corridor reverting back to the underlying landowners once the rails and ties are removed are not applicable in this matter. 5) Although no deeds have been provided it is likely the easements in landowner's deeds in Lake Clear and Ray Brook allows them to cross the railroad to access their properties. Those easements will remain after rails and ties are removed. 1890 – William Seward Webb seeks to extend a rail line from Remsen, NY through the Adirondacks to Malone, NY. After New York State refuses him a right-of-way, he purchases the land for the train corridor outright and begins construction of the rail line. 1892 – Mohawk & Malone Rail begins service on the rail line in the fall which includes a branch service from Lake Clear Junction to Saranac Lake on the D&H Rail Line. 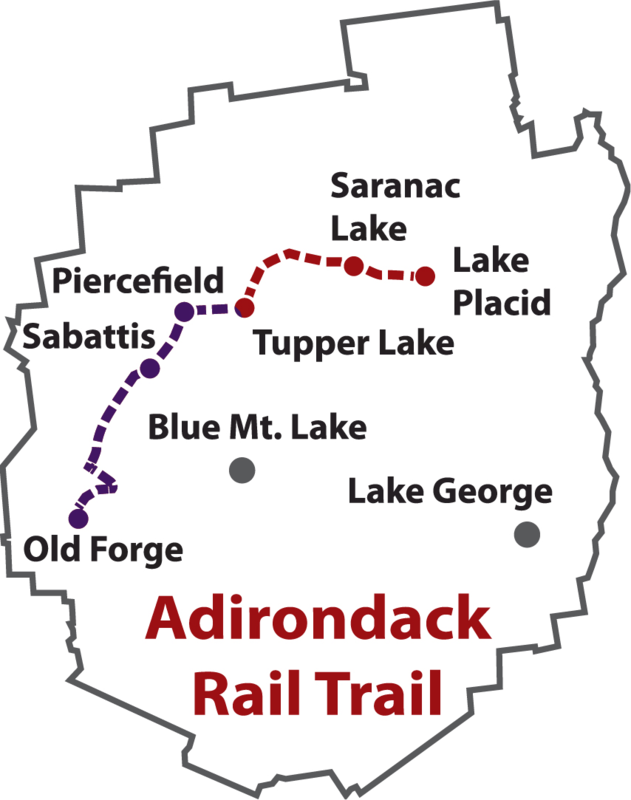 1893 – New York Central leases the rail line from Webb begins operating their Adirondack Division. New York Central extends their service to Lake Placid on the D&H rail line. 1913 – New York Central purchases the rail corridor from Webb. 1957 – New York Central successfully petitions to end passenger service to Malone. The tracks from Lake Clear Junction to Malone were removed soon thereafter. 1968 – New York Central and the Pennsylvania Railroad merged to form Penn Central Railroad. 1970 – Penn Central Railroad transfers ownership of three parcels bounded by North Country Community College to the college (2 parcels) and Essex and Franklin Counties (1 parcel). 1972 – Penn Central Railroad ceases all rail service on the rail line between Remsen and Lake Placid. 1974 – Department of Transportation acquires the Remsen-Lake Placid rail line from Penn Central in order to preserve the rail line the best use could be determined. 1979 – Remsen-Lake Placid Travel Corridor added to the Adirondack Park State Land Master Plan. 1996 – Final Remsen-Lake Placid Travel Corridor Unit Management Plan released.